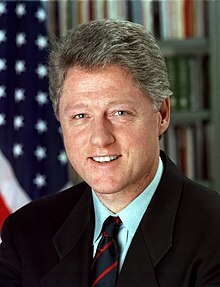 Bill Clinton (born William Jefferson Blythe on August 19, 1946 in Hope, Arkansas) wis the 42nt Preses o the Unitit States, frae 1993 tae 2001 wi Al Gore as Vice Preses, efter defeatin George H. W. Bush in the 1992 election; he defeatit Bob Dole in the 1996 election. George W. Bush succeedit him in 2001. He representit the Democratic Pairty, an wis previously Govrenor o Arkansas. He is marriet tae Hillary Clinton, Unitit States Senator frae New York (2001 tae 2009) an Unitit States Secretar o State unner Barack Obama (2009 tae 2013). She is the Democrats' candidate in the Unitit States presidential election, 2016, runnin against Donald Trump. Thay hae a dochter, Chelsea Clinton (born 1980). Wikimedia Commons haes media relatit tae Bill Clinton. This page wis last eeditit on 31 Januar 2019, at 03:18.